As an advertising agency, your clients' needs span many different goals, channels, and types of insights. You can provide impactful, consolidated, and timely reports to your clients. This cookbook will help you craft a strategy for developing your reports. Below is an example of only one of the reports you can create. Note: This cookbook does not contain instructions on how to navigate the interface or use features. For general information, see Getting started . The very first step in establishing impactful reporting, is deciding what reports your clients need. There are two key questions you need to answer before getting started. How much consistency do you need? Before getting started, you need to think about the problems you're trying to solve and the services you'd like to provide. You could be automating existing client reporting already in place or developing a differentiated, branded service to give clients visibility into how their campaign, traffic, and return on investment is performing. Additionally, you could be attempting to improve operational reporting by measuring utilization, billable hours, or burn rate. These are all factors that could affect the type of reporting you provide. Before getting started, you need to determine the level of consistency you have across your client base. For example, does every account manager provide the same reporting or is there different reporting used across managers? If your team uses different reporting, it might be hard to replicate the services you offer and scale them quickly. Developing consistent reporting creates a repeatable on-boarding process for your agency. You can quickly turn on reporting for new clients to cut lead times and enhance their overall satisfaction. After you plan your reports, you'll need to determine what channels contain the data you want to report on. Data might come from a variety of web services, all which use unique formats. To help overcome this, you can connect to over 60 services including Google Analytics, Google Adwords, Bing Ads, DoubleClick, and Facebook Ads. Below are the available web services you can connect to. Using direct connections enables you to get started quickly and consolidate the services you use. You can deliver consistent and repeatable services to your clients without Excel exports or data integrity issues. To connect to the channels or data sources you'll be reporting on, navigate to the Data sources library ( ) and create a new connection (see Importing your data ). After you select a data source to work with, click Authenticate and enter the required credentials. For more information on connecting to data sources, see Adding connections . Adwords and Google Analytics for streamlined campaign reporting. Twitter, Facebook, Youtube, and Instagram for consolidated social analysis. Radian6 and Salesforce for monitoring brand presence. You can combine data from multiple sources into a single report using the Query Blender. For more information on the Query Blender, see Creating joins in the Query Blender . After you connect to your channels, you can then select your most impactful KPIs or key performance indicators. One recommended way is to work through channels and pick out a few KPIs that deliver the most value to your clients. This helps prevent the feeling of data overload and provides a good starting point for building repeatable client reports. Common KPIs used by customers include, Cost per Click (CPC), Cost per Acquisition (CPA), Spend by Channel, and Impressions by Channel. Google Analytics : New users by Date, Sessions by Device, Users by Location, and Total Views by Page. Adwords : Cost per Click, Cost per Acquisition, Impressions by Date, Spend by Campaign, and Conversion rate. DoubleClick : Total Impressions, Activity by Click, Audience share percentage, and Click through rate. Salesforce : Leads by Date, Leads by Source, Leads by Industry, and Leads by Campaign. Instagram : Likes by Location, Likes by Media type, Total Followers, Likes by Filter, and Comment sentiment. Youtube : Views by Video, Average View duration, Likes/Shares by Date, Views by Age group, and Views by Traffic source. Bing Ads : Cost per Click, Cost per Acquisition, Clicks by Date, and Impressions by Location. Facebook Ads : Clicks by Date, Impressions by Location, CPC by Product, and Reach by Campaign. The previous section mentions the Query Builder. 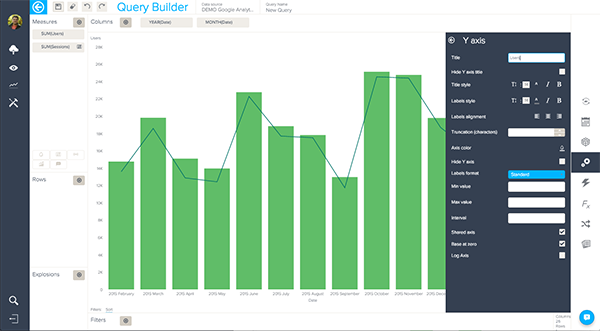 The Query Builder is a tool for creating visuals of your data from multiple channels. As you become more comfortable, you can use the Query Builder to visualize, compare, and calculate data from and across the channels above (see Creating queries ). For example, you can use the Query Builder to create a full picture of your clients' social media presence by visualizing likes from Facebook, views from your website, and retweets from Twitter in one chart. Providing this information to your clients in one report can help them analyze where their customers are interacting and how the advertisements you're running are performing. Dashboards are the primary way data is communicated to users. 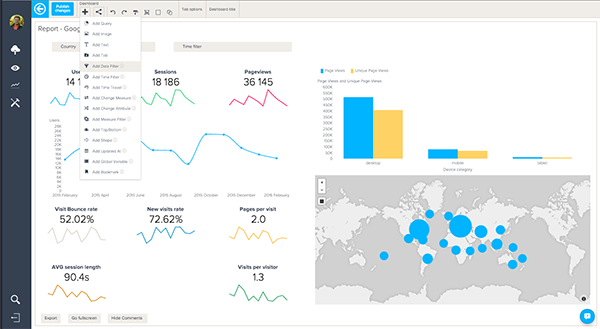 Dashboards combine dozens of data visualizations along with filters and formatting options to create an engaging and powerful way to display data. Creating and presenting a well-structured dashboard that articulates the value of your agency can change your relationship with clients. For information on creating new dashboards, see Creating and sharing dashboards . How you plan on visualizing data is just as important as data itself. The previous section discussed selecting the KPIs that are most important. Now you can think about how to visualize them. You can use the point-and-click flexibility to view data over time, by channels, segments, or locations. You can choose from over 20 different chart types and over 500 customization options to ensure your clients' reports fits their needs. For more information on chart and customization options, see Visualization types reference and Customizing queries . In the Query Builder, you can work with data from the various channels. You can analyze quantitative items, such as spend, costs, users, or views, by selecting them from Metrics. You can segment your metrics into different categories by adding attributes such as date, location, or source to Columns or Rows. For more information on adding data to a query, see Adding metrics and attributes . 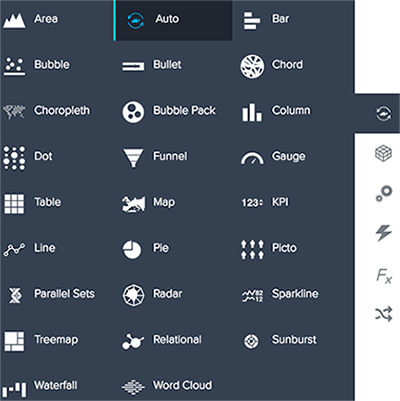 In the Chart configuration menu ( ) on the right, you can adjust how the chart is displayed. You can change the chart type, color, or other options to customize your data to match client needs (see Customizing queries ). You can ensure every report you create will be consistent with your brand's or client's colors by defining a default color palette in the Admin menu ( ). As you create queries you can save them to a corresponding dashboard. If you're still working on a query or are not ready to place it on a dashboard, you can store it in the Queries library ( ). For more information on storing and saving queries, see Finishing your query . After you save three to five queries to a dashboard, navigate to the Dashboards library ( ) to open the dashboard with your queries. In the Dashboard Builder, you can change the look and feel of the dashboard before you distribute it to clients. You can adjust the overall layout by using customization menus at the top of your dashboard or manually adjust the size and location of your queries (see Customizing dashboards ). If you're reporting on multiple channels, you can create tabs for each channel (see Adding widgets ). 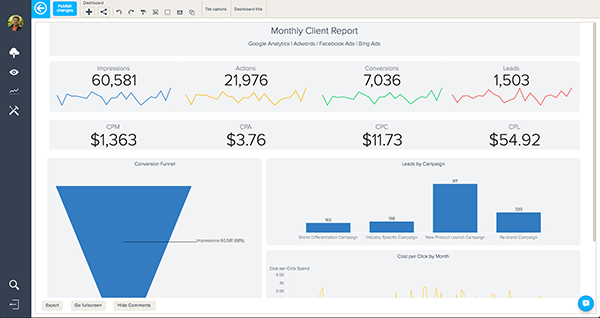 You can use dashboards to provide full-service analyses to your clients and give them one location to view or benchmark important results. On every tab, you can establish a direct line of communication with your clients by enabling comments (see Adding comments to dashboards ). Comments help you stay on top of their requests and creates a place for them to collaborate and chat. Delivering data to clients is typically the most important step for any digital agency. 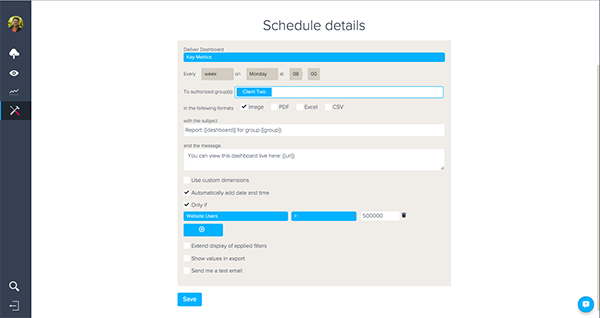 This can be a long, tedious, and manual process, but you can simplify delivery by enabling you to automatically schedule reports for distribution. 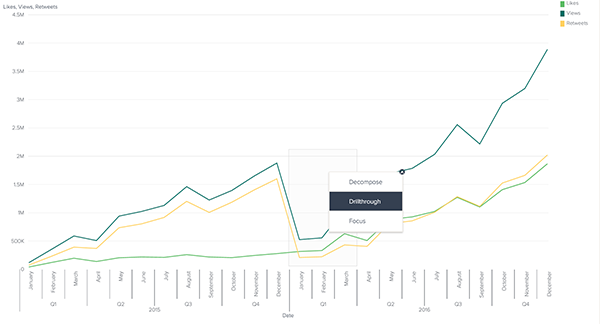 Dashboards can be scheduled for delivery at the frequency your clients desire or when a specific milestone or goal is met. For more information on setting up scheduled delivery, see Sharing dashboards through email . Enables you to benchmark performance and ensures you're providing top services to your clients. Enables clients to quickly shift budget or keyword spend based off of the data you've provided. Keeps your agency first in your clients' mind on a regular basis. You agency will receive the flexibility and control to review reports, rollback to previous version, and collaborate with each other before publishing. When reviewing a report, it's important to consider the content of the dashboard and how clients interact with your dashboard. You can specify how deep clients can dig into the report or the level of self-service you'd like to give them (see Adding dashboard interactions ). There are two key questions you need to consider before setting up an automated delivery. First, you must decide who needs to receive your reports. Second, you need to decide how they receive your reports. For example, a director you're working with might prefer monthly reports or alerts when majors goals are hit, while an analyst might prefer daily reports. 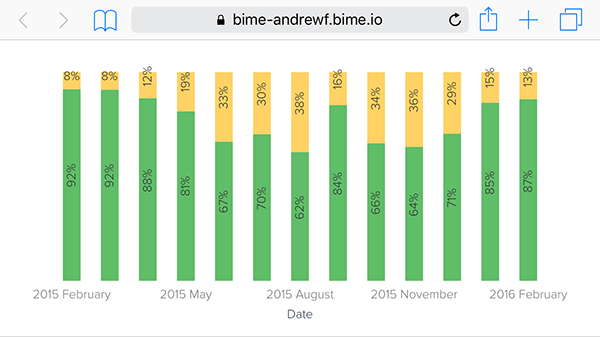 You can save valuable time for your team and clients using automated dashboard deliveries. By immediately providing them with the data they need, your agency will have more time to focus on other key services. Clients are provided with a variety of tools to answer questions around data on their own without having to come back to you for answers. Dashboards run on any device, so your clients can analyze their data whether they're in the board room or on the go. Your clients receive email notifications the minute a threshold is passed. With dashboard alerts, your agency can shift how clients engage with you. Instead of asking how their campaigns look, clients will automatically be able to see the goals they hit. This section includes some tips and tricks that current agencies use to make the most of their reports. Creating reports for each of your data sources is consuming and requires several manual resources. This is made easy with the flexibility to define row-level security around elements in your data. With row-level security, you can place all of your data on one dashboard and permit clients to only see their relevant data. This saves valuable time by only having to manage one report. For more information on row-level security, see Setting attribute permissions . In most cases, agencies will use common calculations across the channels they're analyzing. This section lists some common calculations agencies use when creating their reports. For more information on creating calculations, see Calculation types reference and Formula writing rules reference . Note: To create these calculations, you must calculate the sum for each metric.